Faced with recurrent political and inter-communal violence since 1992, the Catholic Diocese of Eldoret in Kenya has responded in numerous ways to alleviate, contain and end the conflicts that have divided local communities. 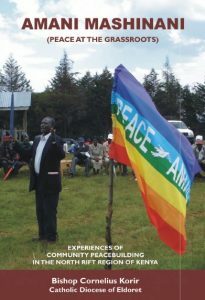 In a new book co-published by the Diocese and Pace University’s International Disarmament Institute, Bishop Cornelius Korir follows up on the success of his 2009 book Amani Mashinani (Peace at the Grassroots), by turning his attention to reconciliation. With co-authors from the Diocese and beyond, Korir shows how reconciliation after violent conflict is a subtle, slow and often difficult process that is not just about ending observable fighting. Drawing on almost 25 years of experience with peacebuilding at the community level, Korir argues that reconciliation requires communities to recognize the worth of other, atone for injustice, heal wounds of the spirit and commit to building a non-violent, equitable and just society. While external actors can support it, sustainable reconciliation requires an intensive focus at the grassroots – maridhiano mashinani – by faith institutions and local civil society to build relationships of interdependence. The book also offers insight into processes of disarmament at the very local level, often overlooked in global and national policymaking processes on arms control, nonproliferation and disarmament. 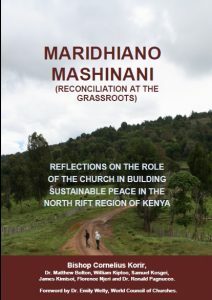 Click here to read a free e-copy of the new book, titled Mardiano Mashinani (Reconciliation at the Grassroots), click here.